The suburb’s embrace of green roofs, rain barrels and rain gardens is a model for others, including Milwaukee. 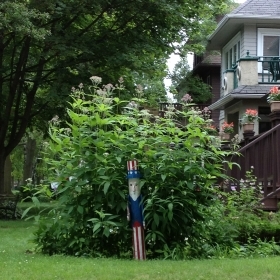 Rain garden off of N. Frederick Ave. Photo by Joe Kelly. For nearly a decade, the Village of Shorewood has been a leader among Milwaukee neighborhoods in installing green infrastructure. Their publicly-sponsored tactics to retain stormwater and runoff have led to the installation of over 240 green roofs, 268 rain barrels and 61 rain gardens, not to mention the disconnection of almost 1,000 downspouts. “This is something we’ve been addressing for years,” says Shorewood’s Director of Public Works Leeann Butschlick, going back to the late 1990’s. 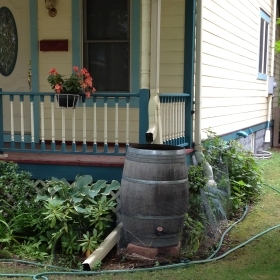 The program provided incentives to Shorewood residents: if more than two downspouts were removed, the residence was provided a free rain barrel. More than four disconnections got a rain garden planted, also free of charge. The program also provided rain barrel and rain garden workshops for residents. “The main thing that Shorewood has done right is they have been very aggressive,” says Bill Graffin, Public Information Manager for the MMSD “They’ve done a good job in trying to supplement their gray infrastructure (like sewers and connecting pipes that don’t leak) with green infrastructure.” Attention to both, Graffin says, is highly important. The residents of Shorewood know from bitter experience why it’s important to retain stormwater and prevent it from running off onto sidewalks and streets. It was, after all, only a little more than three years ago, in July 2010, when the Brew City Flood hammered much of metro Milwaukee. Shorewood was arguably the hardest hit and suffered the most damage. 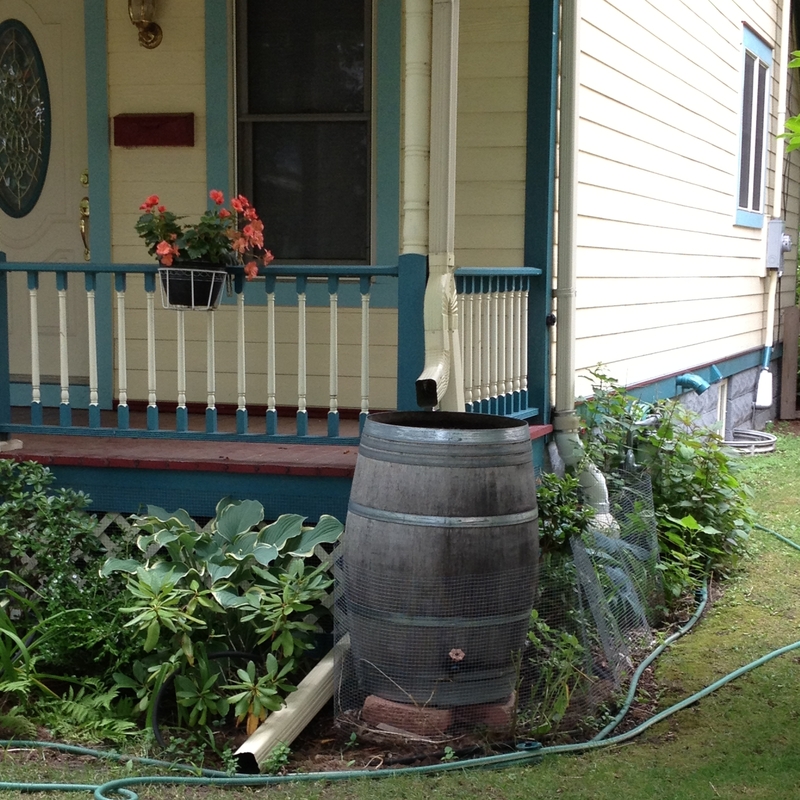 Rain barrel on N. Cramer St. Photo by Joe Kelly. Besides reducing the impact of such floods, the retention of rainwater also cuts pollution in the area. A 2007 joint study led by the Southeastern Wisconsin Regional Planning Commission found that larger “point” sources of pollution, such as industrial pollution or sewage system overflows by the MMSD, cause only about 13 percent of water pollution in Lake Michigan and area rivers. At least 87 percent of the the pollution comes from smaller “non-point” sources — bird droppings and dog poop, lawn and garden fertilizer, salt added to streets and sidewalks, oil and other fluids leaking from cars — all of which gets swept via stormwater runoff into sewers and then into rivers and Lake Michigan. Reduce the stormwater runoff and you give the MMSD a better chance of processing and cleaning all that water, thus reducing water pollution. The remarkable success of Shorewood in adding green infrastructure provides an example for other area suburbs, not to mention the area’s biggest municipality — Milwaukee. Alderman Nik Kovac says that in the Third District he serves, efforts are being made. What a small suburb has accomplished would seem a good model for a tightly-knit, politically-active neighborhoods like Riverwest or the East Side, which both abut Shorewood. Kovac notes the connections between these areas: “There is definitely a lot of social interaction across Edgewood Avenue and the river.” To truly accomplish this kind of change, however, the City of Milwaukee may need to learn from Shorewood and offer similar incentives for homeowners to embrace green infrastructure. We are excited to unveil the two large greenroof areas that are a part of the LightHorse development we’re nearing completion on, along Oakland Avenue. MMSD was instrumental in helping us cover the incremental costs above and beyond normal roofing systems. As an added plus, these green roofs provide passive outdoor recreation – “yard” – area for apartment residents who would otherwise only have balconies. The stormwater benefits are well-discussed, in particular for a site that was 100% impervious and without any stormwater management controls in place. @Bob, That sounds like an awesome amenity, hopefully the future for Multi-Family development where available. Would love to know about the 240 other green roofs. I’ve lived here along time and have never seen or hear of them. I don’t really understand the substance of this article. What exactly has Shorewood done with respect to green infrastructure? There is reference to green roofs, but I agree with Beth S’s comment – where are they? Its great to see leadership from Mandel on their multi-housing project – awesome stuff Bob – but where are the others? I don’t think there are many (or any) residential single family green roofs and doubt there are many (any ) commercial business green roofs. Are there some on public buildings perhaps? If so, surely it falls far short of the hundreds referenced? I would be very curious to know more about this unsupported reference. I hope its true and can’t wait to learn more. The only specific “infrastructure” mentioned was a program that ended five years ago that encouraged downspout disconnection for a rain barrel. I think that is great, but its nothing remarkable. Similar programs have been available in Milwaukee, and the partnership with MMSD is highlighted. The MMSD green infrastructure programs are available throughout the MMSD target area and so those are nothing distinct to Shorewood. I do think I have noticed some bio-swales integrated into a few mainstreet areas in Shorewood, I’m not sure, but that would have been notable to include in this sort of article. What else has been undertaken that makes Shorewood such a “leader”? In addition to outlining specific methods used, were there particular public policies or incentives employed to encourage private sector adoption? Like did Shorewood do something specific to incentivize rain garden adoption, like subsidize plant purchases in addition to providing education? By the way, this is also a program sponsored by MMSD so I am curious to know what made Shorewood stand out. Even assuming there are significant green infrastructure improvements in Shorewood that are not well outlined in this article, Shorewood still had profound issues in recent years. It seems to me that an important benchmark in demonstrating leadership would be either the elimination of those issues or demonstration of significant reductions in stormwater issues. The exact opposite proved to be the case in recent years, suggesting that past efforts have been insufficient in solving the challenges stormwater presents. I’m a big fan of many things being done in Shorewood and I think it is a very progressive, urbanist community in many ways. I also believe they have done a lot and are continuing to do more that should be celebrated. I also love the spirit and intent of this post, and think we can use more stories highlighting successful green infrastructure. I just wish this post actually contained substance on the topic that was of depth and detail to help inform and make the case. I would love to learn more. Juli, I think you make a lot of good points. I must say that I am no expert on this topic but I assume that the seemingly stammering numbers provided In the article pertaining to green roofs are classified in a way that includes partial green roofs/other energy efficient roofing systems. I think that it is also hard to locate these systems and that they are not as eye-catching as we may think. I also think that there are a lot of green technologies and ideas that are being overlooked here. The community deserves a little more credit for some of these, in my opinion, brilliant ideas. Everything has been carfully mapped out with green ordinance in mind. Shorewood is a leader in regard to it’s waste management program. They made the switch to LED street lamps. They have always encouraged biking and walking in the community. (Installing racks all over the place) even the pavement is green containing high albedo. I also think that the rain runoff gardens are awesome and may also be hidden in ways that arent nessesarily staring us in the face, similar to the green roof thing. I have even heard that our allyways hold some green validity in regard to runoff. I ultimately think that nieboring communities can learn a great deal from some of our green initiative focus. And that our problems with our sewage system is a difficult problem to face, but I have the utmost faith in the cities ability to control it. I admire your attitude of questioning the numbers and everything else. Most people read an article like this and just say “wow”! Or pat themelves on the back. Even though mr. Kelly only emphasizes a couple green elements in the article I think it is very well written and it emphasizes what is happening now. What an article like this is good for is it inspires people to do research. While at the same time it shows what green ideas are trending recently which in turn might inspire more runoff gardens and green roofs to be built.